At Doheny’s Crash Repairs, we provide the full range of services necessary to get your vehicle back on the road in top condition following a crash, and to keep you moving while we do so. If required, we can arrange use of a replacement vehicle for you while your own is being repaired. One of our expert estimators will carefully assess the damage to your vehicle and produce an accurate repair estimate using the computerised Glassmatix estimated system that is required by all leading insurers. The estimate will be provided to both you and your insurance company, and our estimator will contact you to explain all repairs deemed necessary and why. 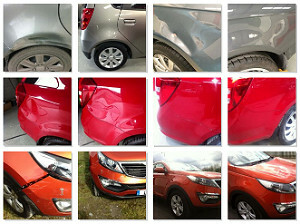 We use state-of-the-art technology for all aspects of crash repair work, and the process is thoroughly recorded at all times via photography and other data storage. Any vehicle panels being repaired or replaced will be fitted and checked for correct alignment and all will be finished to the highest standards before being allowed proceed for paintwork. Four wheel alignment, headlight alignment, air condition servicing and alloy wheel refurbishment are among the other services we provide. All vehicles are fully valeted at the end of the repairs process, before being returned to their owner. Once your vehicle is ready to return to the road, we can deliver it to you at your home, workplace, or other convenient location, if you are unable to pick it up from our premises yourself. Simply contact us to avail of our professional service, help and advice. We’ll get you back on the road in no time!